above: former Liberal MP and now lobbyist for the most wealthy superannuants, John Brogden. 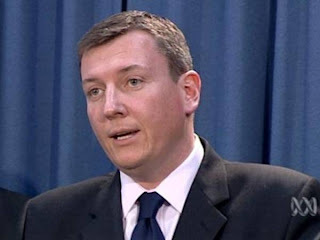 Threatened a mining industry style fear campaign unless Labor capitulated on superannuation tax shelters for the rich. Average taxpayers, workers, the elderly and the poor - to pay the price. For a long time, now, there has been an ongoing campaign on Superannuation Concessions: led by Richard Denniss of the Australia Institute. Superannuation Concessions for the top 5% income demographic cost the Australian taxpayer over $10 billion a year as things stand. That is set to rise to $15 billion by 2015. Labor is hard-pressed to fund Gonski and NDIS - as well as other crucial policies on Aged Care insurance and transport infrastructure. 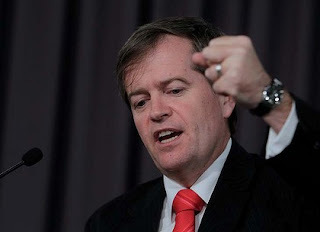 The recent annoucement of Labor policy on superannuation concessions by Bill Shorten was very disappointing. The total cost of all superannuation tax concessions will be $45 billion by 2015 according to Denniss. But failing to fund Gonski and NDIS could be much more damaging for the ALP come September. There comes a time when you have to 'stand and fight' - and not just 'neutralise' every difficult issue by capitulation to the Conservatives and the most wealthy vested interests. And surely ALP strategists must realise by now that most of the monopoly media will spin anything they say and do against them regardless of the actual policy. 'Neutralising' this issue provides only very limited 'breathing room'. Lacking the necesary funds for 'signature policies' such as Gonski and NDIS will be far more damaging come September. Unless Labor finds other progressive funding mechanisms in the May Budget - without further callous and unpopular austerity. I am arguing for another look at dividend imputation, the Minerals Resource Rent Tax, income tax structure, a tax on inheritances valued over $2 million, and an increased Medicare Levy to help pay for NDIS. I welcome people to post their own ideas here at the blog too - in an attempt to get some debate going on how Labor can retrieve its Budget position without austerity or compromising signature policies. What follows below are three links to recent articles on these issues published at our 'sister site' 'ALP Socialist Left Forum'. Beneath that we are also publishing some links to prior articles from this blog on Aged Care - to impart a sense of just how urgent action is on that front for May. A statement put out by Shorten is also republished below at the end of this post - so readers understand what the Labor Policy really is. We also need to consider the plight of our most vulnerable aged citizens: their unnecessarily pronounced suffering as a consequence of insufficient funding for Aged Care; and the highly regressive ‘user pays’ mechanisms that apply. I ask readers to keep the issues in mind that are raised in the articles linked to below for the May Budget. The articles are republished from this blog in previous years... But I am hoping readers will be of a mind to refresh their understanding of just how much many Aged Australians suffer, and how urgent action in the Budget is. Between now and May we need to press the government hard to do something very significant on Aged Care - both its quality, and addressing regressive user-pays funding mechanisms. And finally we turn to that statement by Bill Shorten - to establish the facts of the matter. As against the Liberal fear campaign; and quite aside from my personal disappointment on the government's superannuation concessions policy. Again - debate welcome! Above: A message for Bill Shorten - Please do whatever you can to lock in funding for Gonski, and for the NDIS which you were instrumental in championing; And Please do not do so at the cost of further callous austerity as in the case of Sole Parents! You've probably heard a lot of talk about superannuation lately – and a lot of misinformation. Today Labor announced how we'll make superannuation fairer for those on lower incomes and more sustainable for the future. Can you share these facts and set the record straight? 2. Only people with superannuation savings of $2 million or more will be affected by these changes – this is only 0.4% of Australians retiring in 2014-15. 3. The Liberals want to cut additional superannuation support for 3.6 million low paid Australians, including 2.1 million women, and oppose these changes for 16,000 wealthy Australians. Former Prime Minister Paul Keating says the changes are in keeping with the original intention of Labor’s superannuation system, which was never meant to be an income shelter for those able to contribute increasing levels of precautionary savings. Can you tell your friends and family about these changes so more people know the facts? This is the statement at the 'GetUp!' website on Superanunation Concessions for the wealthy. "There has been a lot of confusion since the launch of this campaign, mostly caused by lazy journalism and deliberately misleading talking points from the Coalition. GetUp is campaigning for tax concessions on voluntary contributions to be removed. That means super contributions made by the wealthiest Australians would be taxed just like regular income. The current tax concession laws are like a gift into the pockets of the wealthiest Australians, payed for by the taxes of low and average income earners. That's not fair. We're proposing a change that would affect only the wealthiest Australians to make superannuation more equitable for everyone. In fact, the cost of tax concessions given to the wealthiest 10% far exceeds the cost of just paying them the age pension."